Both runs on Android 8.0 (Oreo) with EMUI 8.0 on top. It has a 13-megapixel autofocus rear camera with PDAF and an 8MP front camera. It has a metal unibody design and also has a fingerprint sensor on the home button, below the display.The 10.8-inch comes with Quad Speakers and the 8.4-inch version has Dual speakers. Both have Huawei Histen sound support, are Harman Kardon audio certified and Support Hi-Res Audio. These have 5100 and 7500mAh battery, respectively with support for the QuickCharge technology. The larger model also has pogo pins on the back for keyboard support. 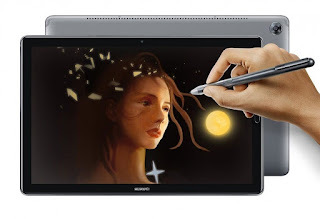 There is also MediaPad M5 Pro model that has similar specifications as the 10-inch model, but it comes with M-Pen Stylus with 4096-layer pressure sensitivity. Huawei MediaPad M5 10.8″ and 8.4″ comes in Champagne Gold and Space Grey colors.It will roll out from March in most European countries, as well as the U.S.